Hey there Paper Peeps! Well we are starting to have a few cooler days and a bit of crispness to the air. Fall is just around the corner and it’s one of my favorite times a year. 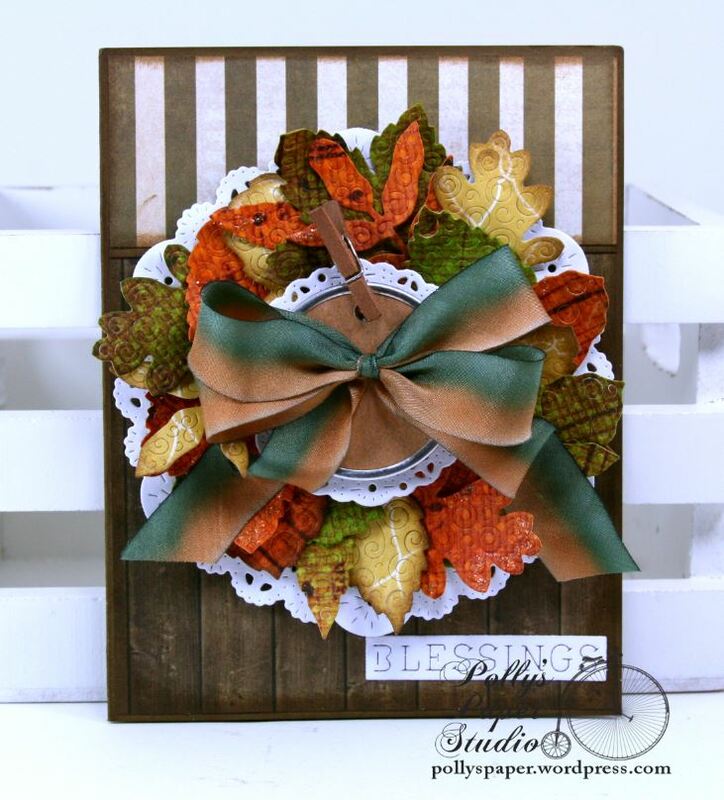 Beautiful Fall wreaths full of richly colored leaves are an iconic seasonal decoration and is the inspiration for this card. 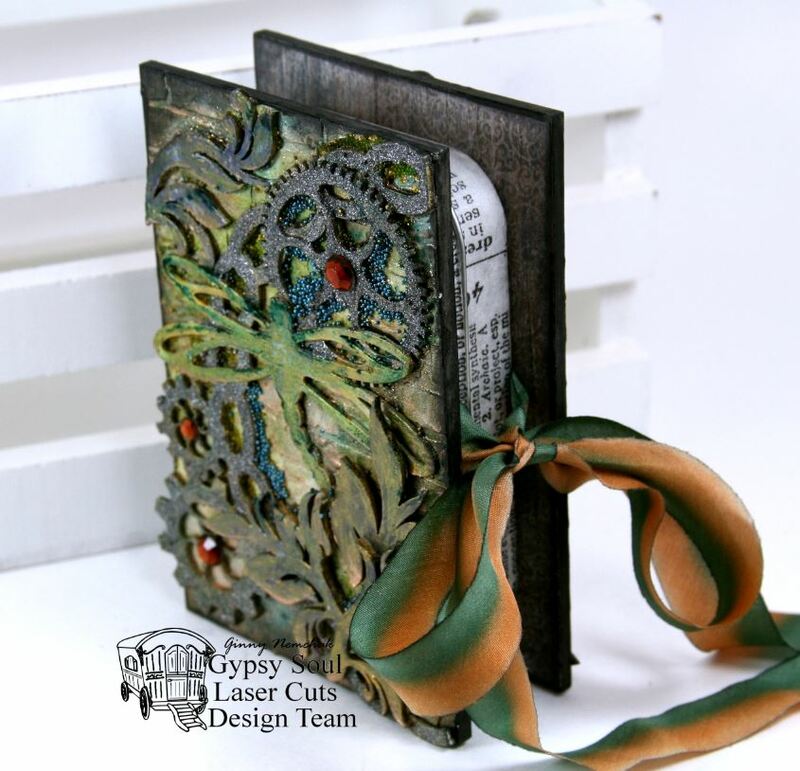 I started with a card base in the A2 size cut from chocolaty cardstock. 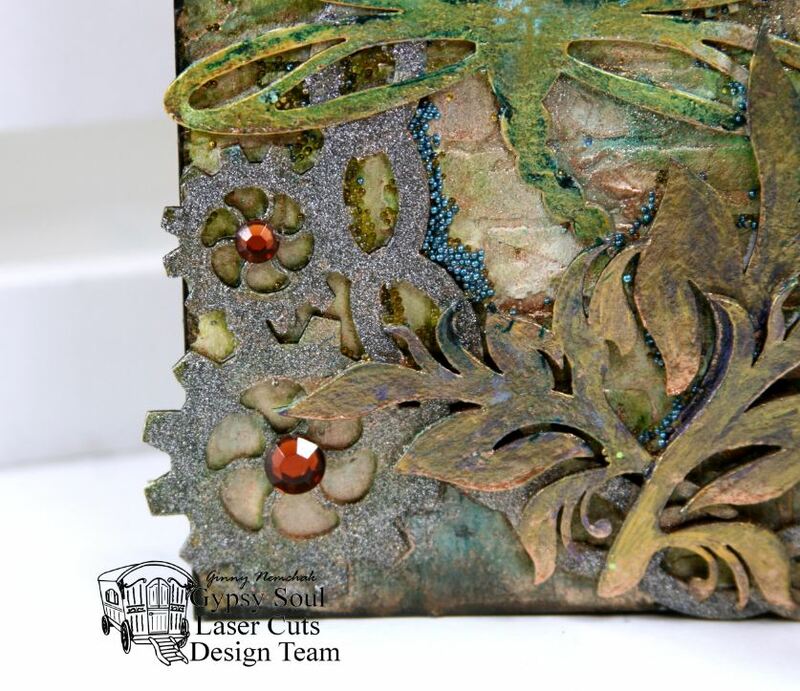 I knew the leaves would create a lot of contrast and texture so I kept the background papers fairly neutral. I used the Fall Leaves die to create a nice pile of leaves to assemble a generously filled in circle. Inks and Stickles add detail to the leaves. 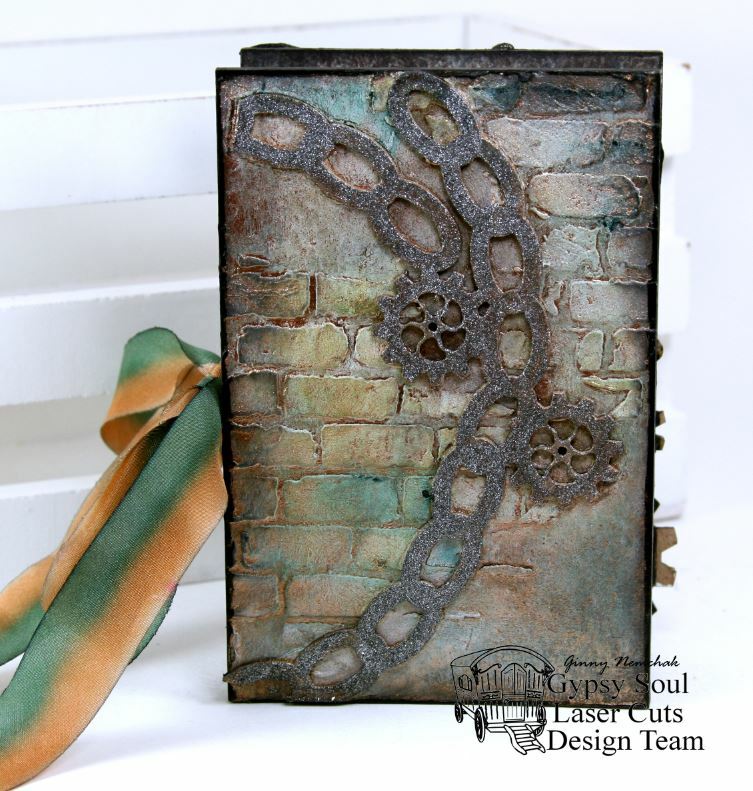 This Blessings sentiment block is a nice contrast to the dark background. I layered the wreath on to a French Pastry die cut from crisp white cardstock. 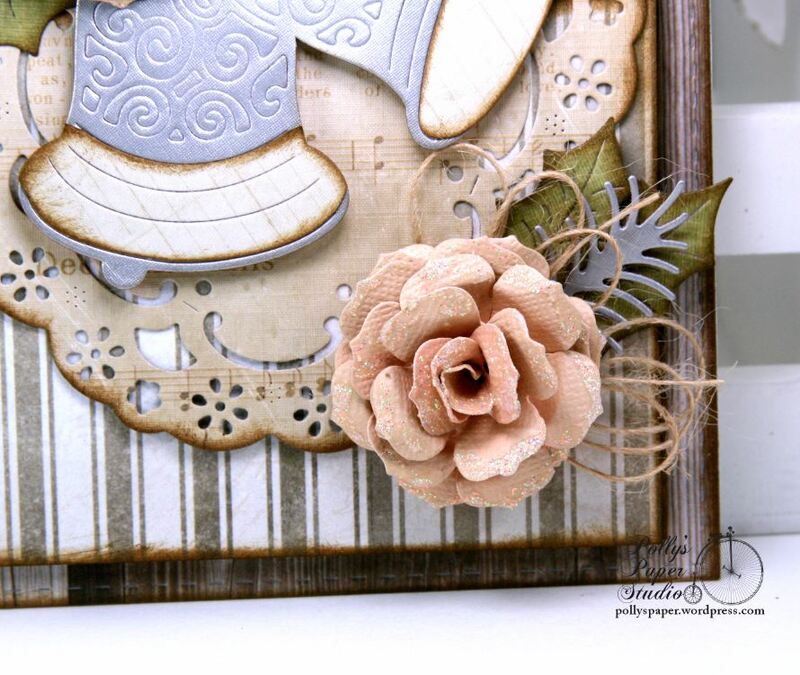 An additional smaller French Pastry Tiny Doily die is centered over the wreath and given dimension with chipboard spacers behind. 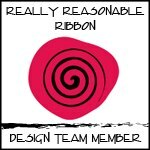 It’s topped off with a metal rimmed mailing tag , wooden clothespin and beautiful bow of hand dyed silk. Bending and shaping the individual leaves before securing gave the wreath a lovely full and dimensional look. What’s great about this cover is it’s like working with a mini canvas. Also is realllly thick so there’s no need to worry about sprays and paints and gels. I really went at it with every supply I had I think and it’s still nice and sturdy with absolutely no warping. To create a nice base I used some texture paste and a brick wall stencil to add dimension. After giving all the elements a coat of gesso I decided on the arrangement and glued it all in place. I used just about all my sprays and mists to create a very mottled effect. For the bloby areas I took the sprayer out of the bottle and dabbed it on for a more opaque effect. Hey there Paper Peeps! Ginny here to share a really festive and fun Christmas Greeting card I created with the fabulous trims from Really Reasonable Ribbon. This is the first Christmas card I have made in quite a while that does not have a vintage or retro image….but I was so inspired by the buffalo checked paper that I knew graphic pops of color would be a much better match. This Hounds Tooth Ribbon coordinates so well and is topped of with Ivory Burlap String and a simple painted jingle bell. 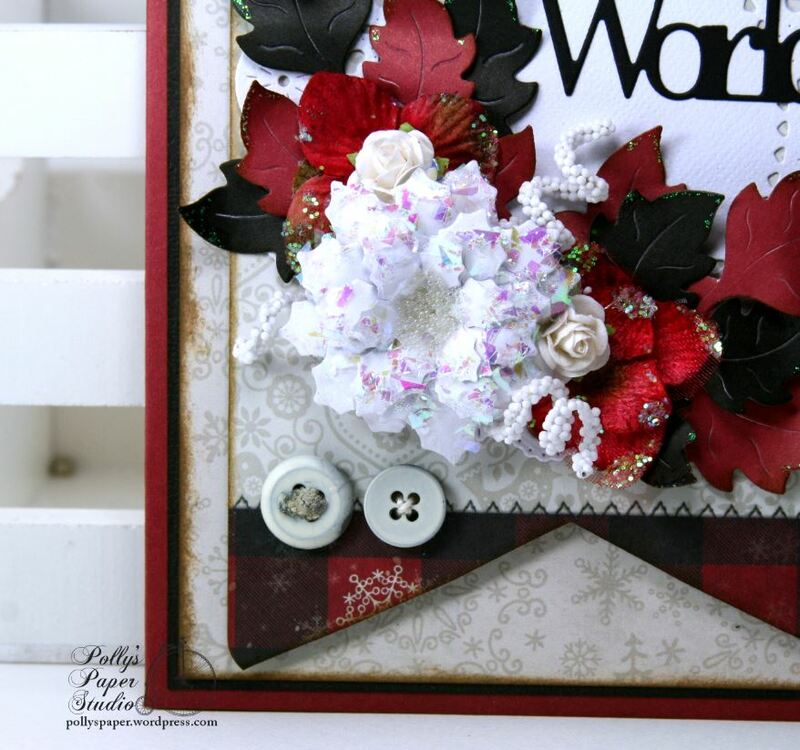 Handcrafted poinsettia flower is layered with some Petaloo blooms and die cut leaves with the same red and black theme. 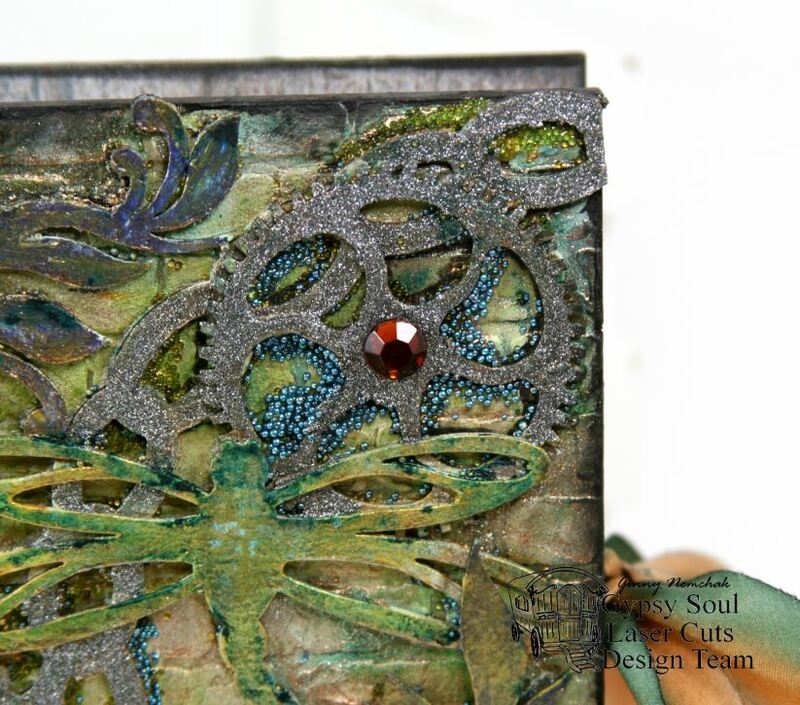 These great little buttons and Spiral Stamens help to add detail to the corner. A few more die cut flowers here with additional tiny White Open Roses. A die cut doily is a nice backdrop for the sentiment. 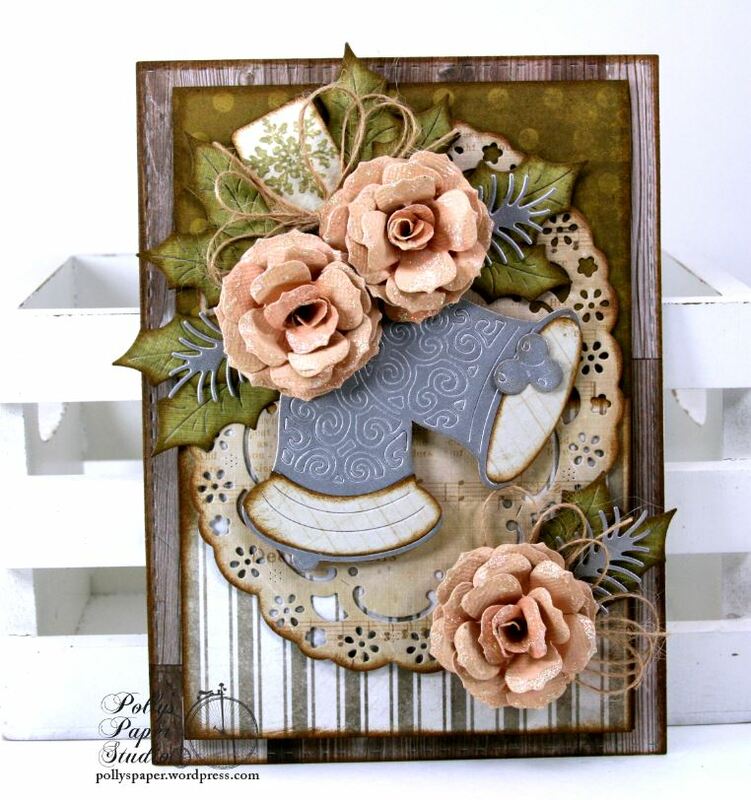 I love how dimensional this card turned out with all the layers. 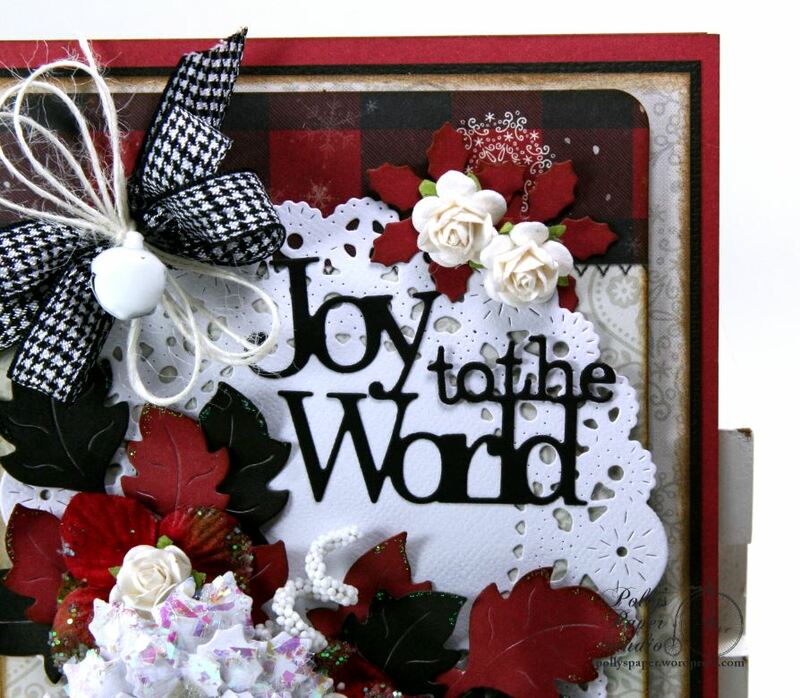 Cheery Lynn Designs Dies~ French Pastry Doily, Joy to the World Wreath Set, Poinsettia Strip, Flourish 14. BoBunny Supplies~ Merry & Bright Journal Contents. Hey there Paper Peeps. 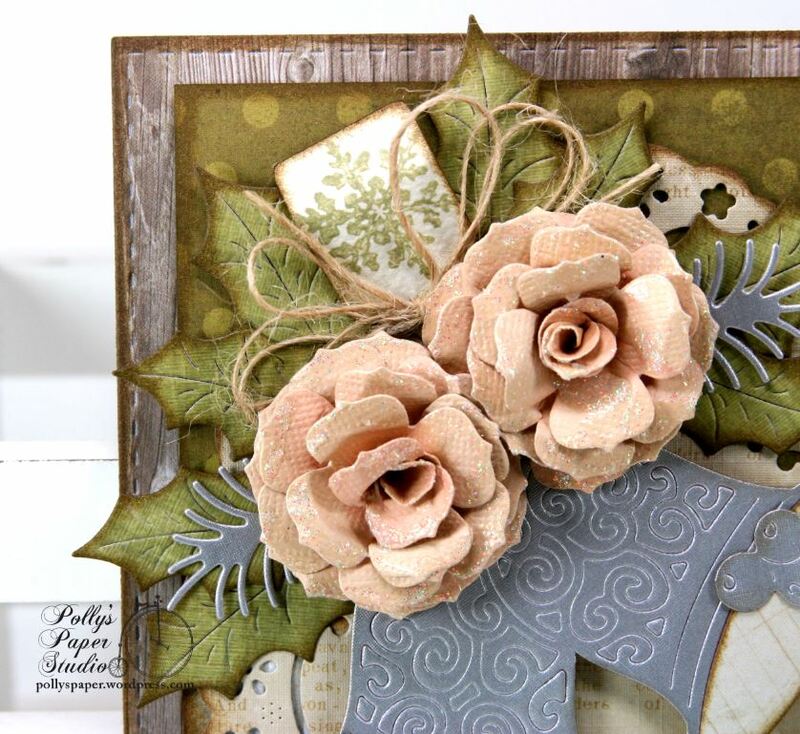 Ginny here to share a softly colored and shabby inspired Christmas greeting card created with the fabulous Cheery Lynn Designs dies. 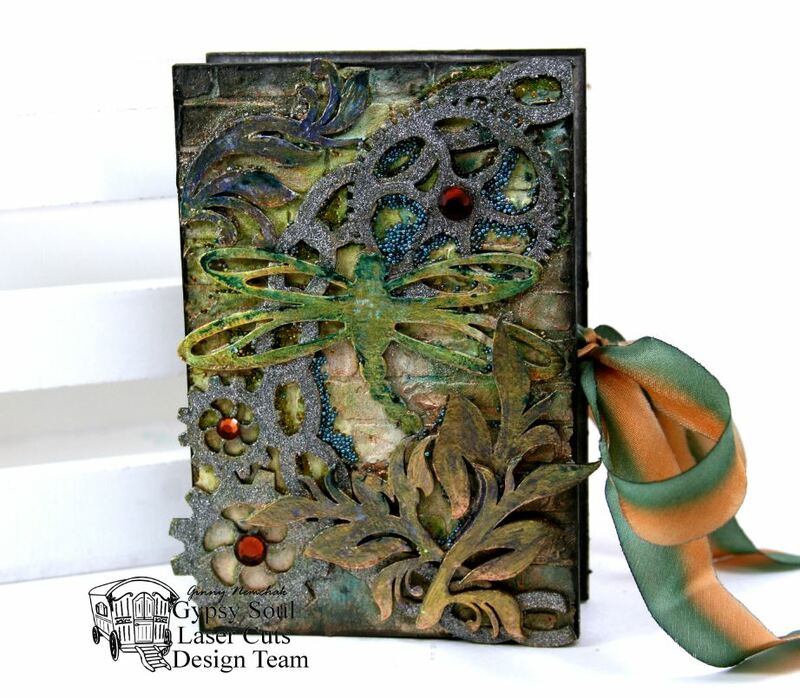 I used the Rectangle Stitch and Cut die to create a background with the wood grain patterned paper then layered on a green and very subtly polka dotted pattern. These gorgeous flowers were created with the Gardenia Strip and given a little inking and glitter to give them a frosty appearance. The Christmas Bell was cut from silver cardstock with my very old cutting plate so I could keep the inside pieces from falling out. Once cut I added an additional piece of solid cardstock on the back to secure the pieces and trimmed it out. Once secure I was able add spacers behind the bells for dimension. To fill out the arrangement I tucked in a sweet little snowflake stamped tag with twine. The Swedish Spring Oval Frame is a lovely backdrop for the bells and an additional small flower arrangement. I couldn’t resist adding a layer of shabby style grey striped paper. Hey there Peeps! 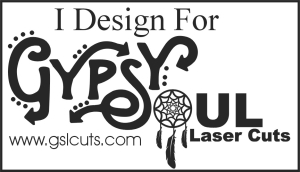 Woo hoo it’s Sunday and that’s my day to share on the Gypsy Soul Blog – yay!!! 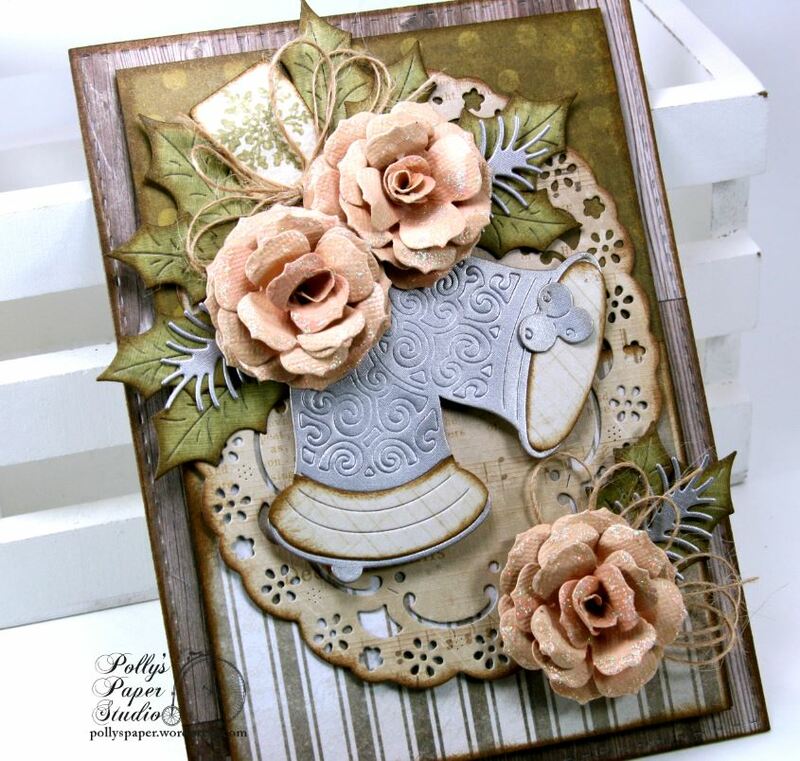 Today I’m sharing a pretty awesome retro inspired greeting card created with GSL chippies, mixed medium supplies, patterned papers, and vintage images. 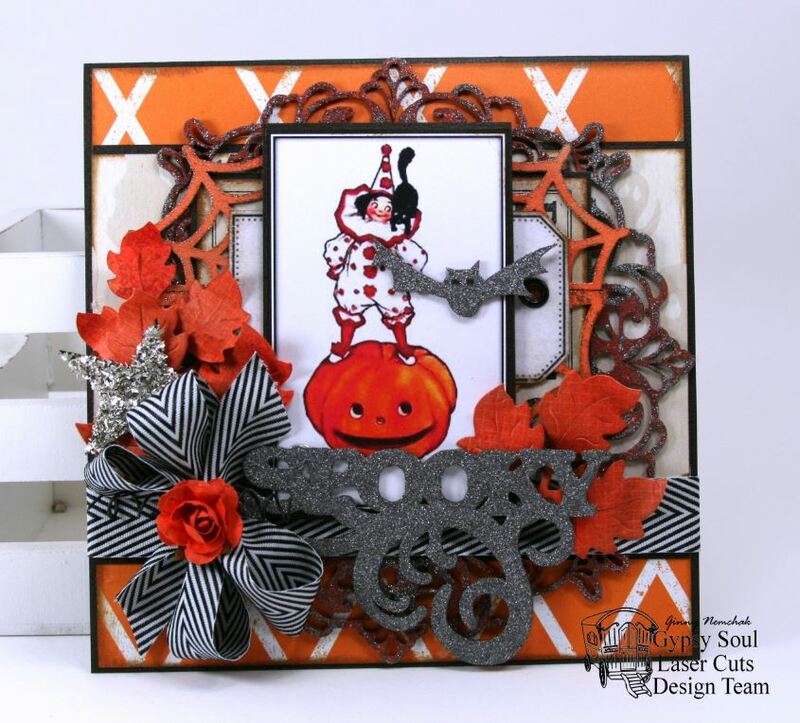 This is another fabby project created with the Retro Halloween Creativity Kit 2016. For more projects with the kit please take a look at my post from yesterday. Squeeeel I love how this turned out, well worth the painted hands and table lol. What can I say..I really get into the art! The base for the arrangement was a Deco Frame. I used a makeup applicator to pounce on rust colored texture paste. 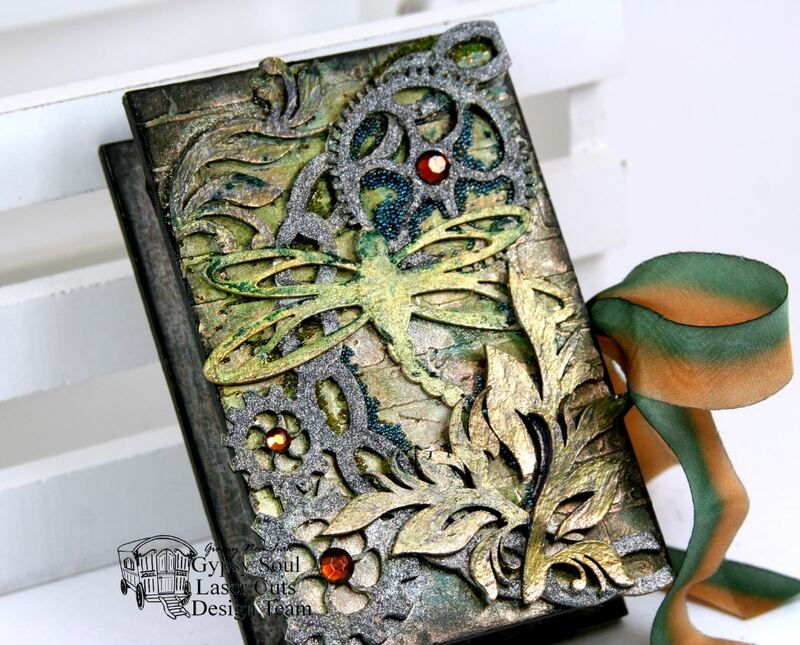 While it was still wet…I used the same applicator to add a mottled layer of Steel Luxe paint. For the spider web from the Spooky Shapes Set I gave the chippies a base coat of white acrylic then when dry I used a blending tool to color with Staz-On ink in Orange Peel. When it was dry I pounced on some of the Steel Luxe paint that was still on the applicator from the frame. 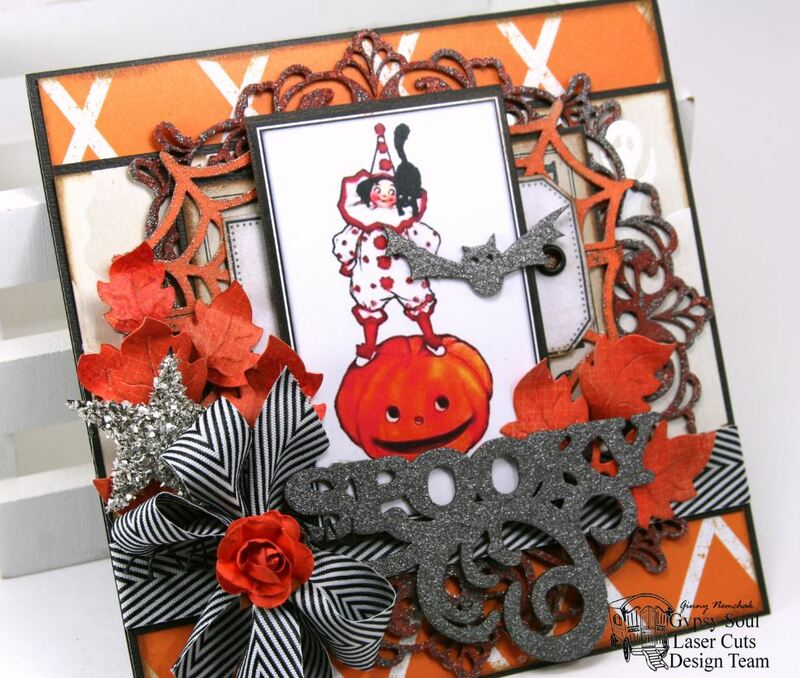 This Spooky sentiment and bat are sweet and also came in the Spooky Shapes Set. They were finished simply with the Steel Luxe paint. 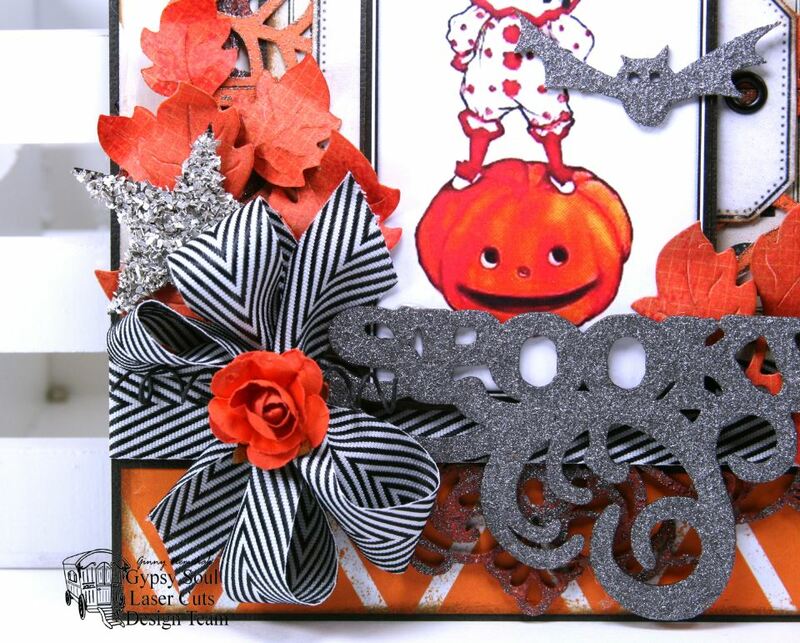 I accented these fun and funky Halloween embellies with a poofy ribbon bow, a glass glittered star, die cut leaves and an itty bitty flower. Hey there Paper Peeps! 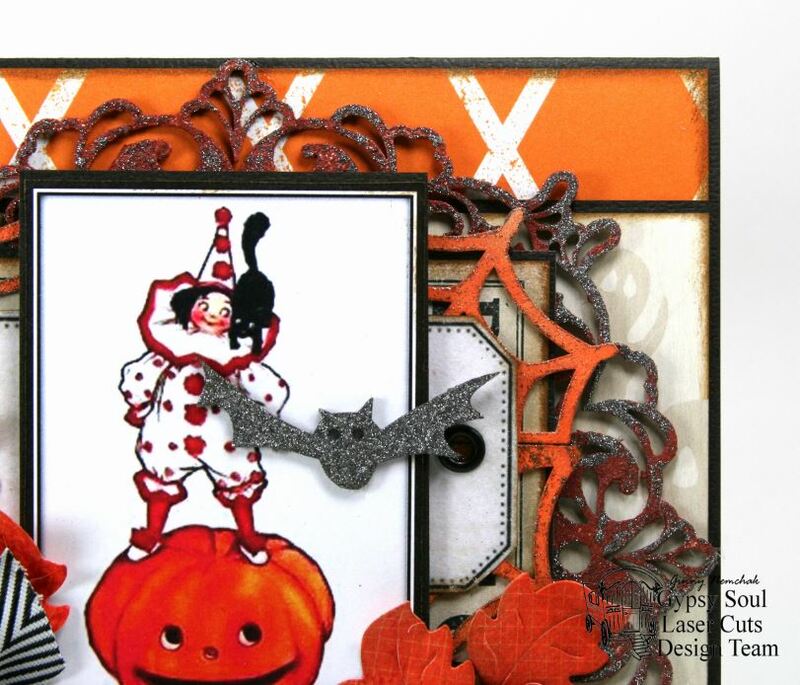 Whoo hooooo what a great day to share some fabby projects I created with the new Retro Halloween Creativity Kit 2016. For reals y’all this kit was sooooo great to work with I could not stop. I was able to get 15 projects from this kit. Whaaaa???? Yes you read that right. 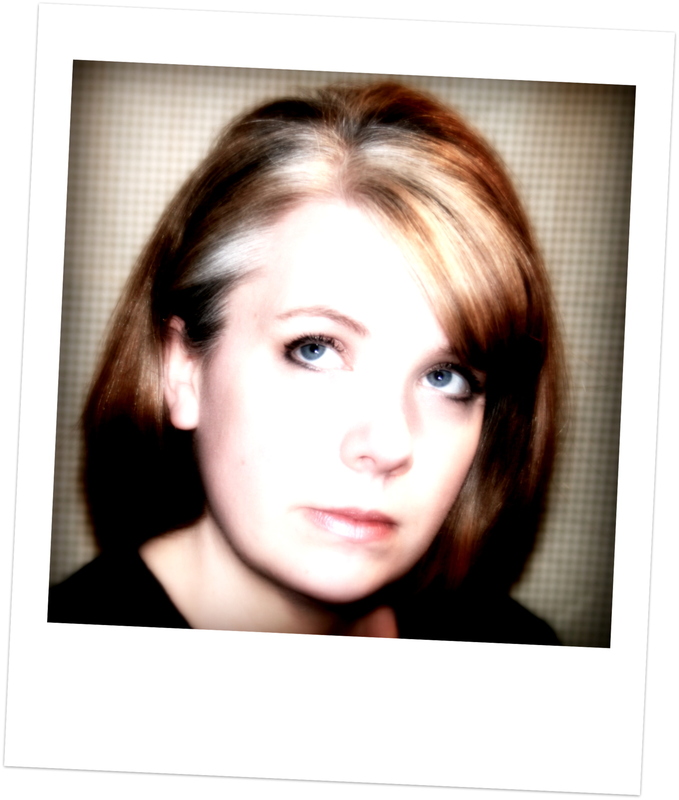 I’m sharing 14 of them today…one more tomorrow for another post. Hey there all you fabulous Paper Peeps! It’s a great day for having a blog hop don’t you think??? We do!!!! 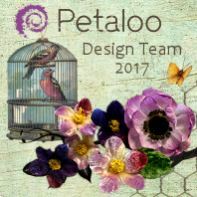 We were tasked this month to create projects featuring flowers created with the Cheery Lynn Dies and maybe share some tips or techniques. You should be coming to me from the lovely and talented Christina. 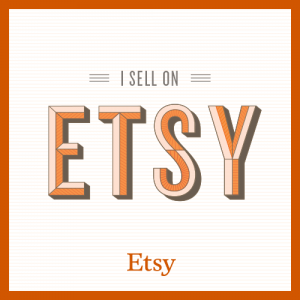 If you’re just joining in you’ll want to head over to the Cherry Lynn Designs Blog to start at the beginning. 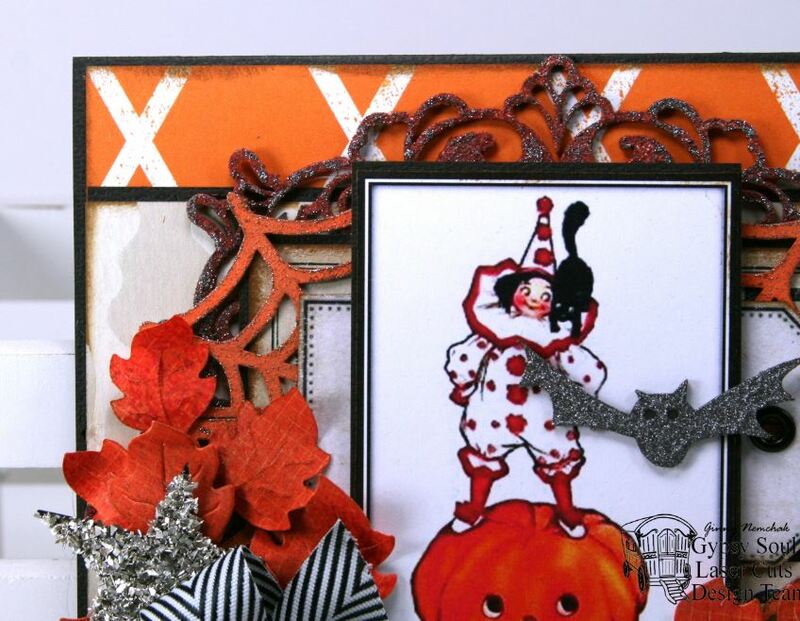 I chose to create a Halloween card. A tip I can share about flower dies is….why not use a holiday or flower die for something other than it’s intended season? 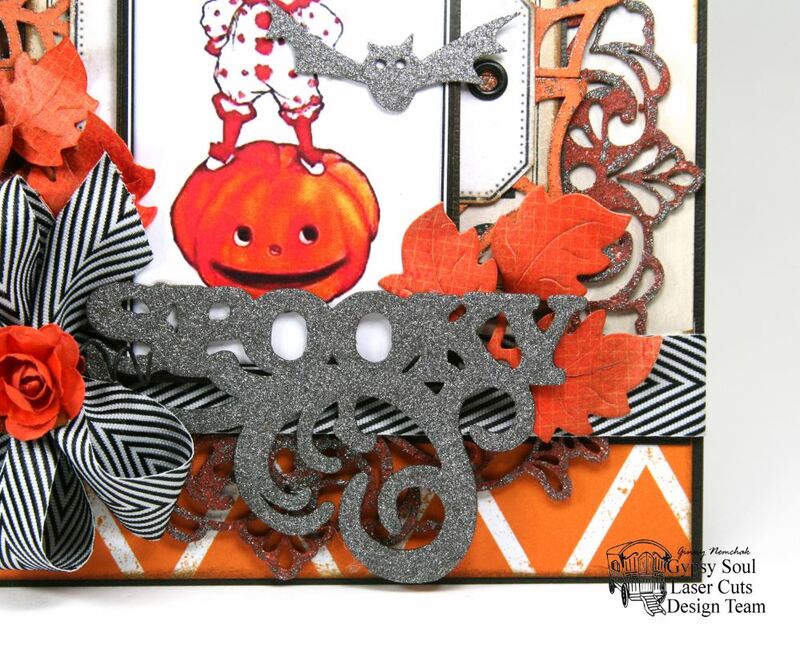 I selected the Poinsettia Strip die and cut the flowers with black cardstock to make them work for Halloween. I’m sure you can guess I had a lot of fun creating these spooktacular Poinsettias. This little Winter Neighborhood Border village also comes from the Christmas section…I added white cardstock to the back to enhance the window openings and secured it with a nice curve to be dimensional. It also gives me room to layer in some additional flowers. Finally something from the real Halloween section lol these groovy Jack-O’-Lanterns cut from polka dot papers and inked well to enhance the details. I wanted to bring the orange color up to the corner so I just secured some buttons tied with string : ) Easy peasy. The smaller flowers are Cherry Blossoms that were finished simply with a shaping tool and a little distress ink. Anddd we’re back in the Christmas section with the Joy to the World wreath minus the sentiment part and topped off with additional blooms. You can see I added some Black Diamond Stickles to the tips of the petals and Pop micro beads to the center. 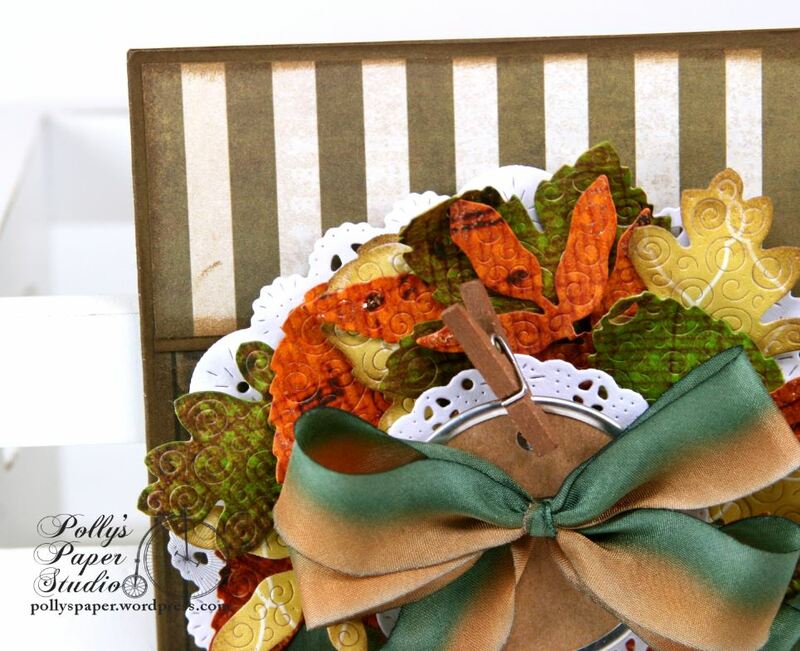 A fabby layered bow with seasonal ribbon and topped with some twine and a painted jingle bell and this card is done!